Underground Warning Tape Fibre Optic 365m x 150mm Roll. This underground warning tape should b.. Underground Warning Tape Water 365m x 150mm Roll. This underground warning tape should be inst.. Underground Warning Tape Gas 365m x 150mm Roll. This underground warning tape should be instal.. Underground Warning Tape Sewer 365m x 150mm Roll. This underground warning tape should be .. Underground Warning Tape Electric 365m x 150mm Roll. This underground warning tape should be i.. Underground Warning Tape Street Lighting 365m x 150mm Roll. This underground warning tape shou.. 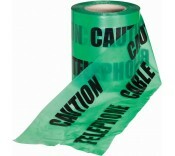 Underground Warning Tape Telephone 365m x 150mm Roll. This underground warning tape should be ..
Electric detectable underground warning mesh is a traceable marker mesh for marking und..
Gas detectable underground warning mesh is a traceable marker mesg for marking und..
Water detectable underground warning mesh is a traceable mesh for marking underground p..
Telephone detectable underground warning tape is a traceable marker tape for marking underground ..
Manchester Safety Services stocks a great selection of underground warning tapes. These underground warning tapes are designed to enable services such as electric cables, telephone cables, water pipes, sewer pipes, gas pipes, street lighting cables and fibre optic cables to be located without damage. The tape is 150mm wide and there is 365 metres on a roll. We also stock a range of detectable underground warning tapes. These detectable underground warning tapes are a traceable marker tape for marking underground pipes and cables. The integral metallic wires enables location by using cable location tools making it an essential product to lay over non-metallic pipes or un-energised electric cables.